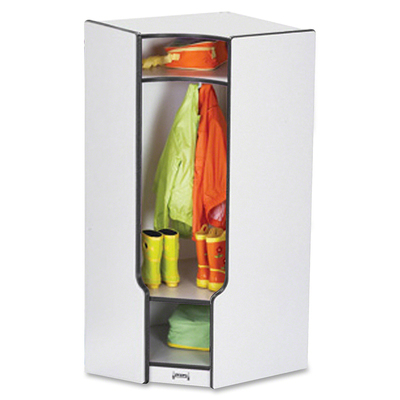 Corner Coat Locker Lets You Combine Lockers To Create A Welcome Look. Hang Jackets And Backpacks On The Double-Hook Coat Hooks In Each Locker Section. Open Shelves On The Top And Bottom Of The Locker Provide Additional Space For Boots And Lunch Boxes. Open Locker Section Offers A Handy Edge For Sitting While Tying Shoes Or Putting On Boots. Kickplates Prevent Toe And Finger Pinching. Small Objects Can'T Get Underneath The Low-Sitting Design. Dowel-Pin Construction Prevents Weakening At The Joints. Kydzsafe Rounded Edges Allow Children To Play Safely Without Getting Hurt By Sharp Edges Or Corners. Truedge Is Permanently Thermo-Fused To The Edges To Prevent Chipping.. Corner Coat Locker Lets You Combine Lockers To Create A Welcome Look. Hang Jackets And Backpacks On The Double-Hook Coat Hooks In Each Locker Section. Open Shelves On The Top And Bottom Of The Locker Provide Additional Space For Boots And Lunch Boxes. Open Locker Section Offers A Handy Edge For Sitting While Tying Shoes Or Putting On Boots. Kickplates Prevent Toe And Finger Pinching. Small Objects Can'T Get Underneath The Low-Sitting Design. Dowel-Pin Construction Prevents Weakening At The Joints. Kydzsafe Rounded Edges Allow Children To Play Safely Without Getting Hurt By Sharp Edges Or Corners. Truedge Is Permanently Thermo-Fused To The Edges To Prevent Chipping.